Go to the Home screen of your phone and tap the Apps icon. Now tap Contacts and if necessary, tap the Contacts tab. Now tap on Import/Export option. 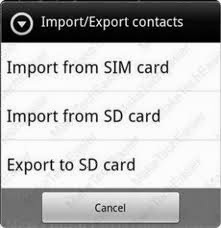 If you want to export, tap Export to SD Card then OK to confirm the action. On the other hand, if you want to import just tap Import from SD Card. Choose which account you want contacts to be saved in to. If there's only one contact file to be imported, contacts automatically be added and you're finished. In case you have multiple contact files on your SD card, you will be prompted with three options: Import vCard File, Import Multiple vCard Files, and Import All vCard Files. Choose which vCard file(s) you want to import and tap OK. Problems with your Galaxy Note 3? You may have just bought your Galaxy Note 3 but if you're experiencing problems you don't know how to fix, do send us an email at sebertech@gmail.com and will find solutions, or at least explain, to your problem. By the way, if this guide helped in some way, please share it. Thanks.